Twenty-eight tribal leaders in Washington state have written President Obama insisting he stop the Dakota Access Pipeline. Yakama tribal member Marshall Lee, a 38-year-old father of two, has been at the Standing Rock camp since last August. 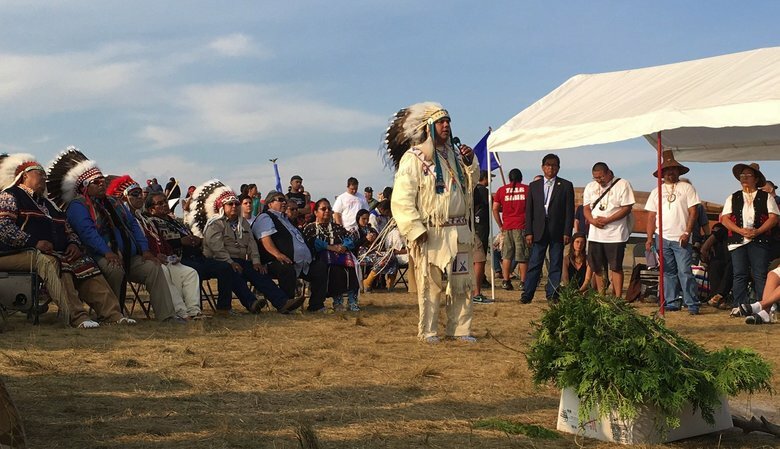 Washington tribes have rallied to the cause of that Standing Rock even as they fight their own fossil fuel battles back home. In their letter, Washington state tribal leaders said the U.S. Army Corps of Engineers should deny the last easement needed by Energy Transfer Partners of Dallas to complete the more than 1,110 mile-long Dakota Access Pipeline. Washington tribes signing the letter to Obama were the Lummi Nation, Nooksack Tribe; Sauk Suiattle Tribe; Upper Skagit Tribe; Tulalip Tribes; Stillaguamish Tribe; Puyallup Tribe; Nisqually Tribe; Port Gamble S’Klallam Tribe; Suquamish Tribe; Squaxin Island Tribe; Chehalis Tribe; Jamestown S’Klallam Tribe; Lower Elwha Klallam Tribe; Makah Tribe; Hoh Tribe; Quileute Tribe; Quinault Tribe; Snoqualmie Tribe; Cowlitz Tribe; Shoalwater Bay Tribe; Yakama Nation; Confederated Tribes of the Colville Reservation; Spokane Tribe of Indians; Kalispell Tribe; Samish Nation, and the Affiliated Tribes of Northwest Indians. Responses to "Twenty-eight tribal leaders in Washington urge Obama stop Pipeline"